Due to an unforeseen change of important events for Mexican wolves, we have RESCHEDULED the Big Lake Howliday Campout to the weekend of August 8-11, 2014. We deeply apologize for any inconveniences this change of dates may cause you in arranging your travel plans, but we sincerely hope you can still join us at Big Lake. Thank you! Join the Grand Canyon Wolf Recovery Project for a fun-filled weekend learning about and celebrating the return of Mexican wolves to the wild. This year marks the 16 year anniversary of the first releases of Mexican wolves back into the wild in the Blue Range Wolf Recovery Area. Suggested Donation is $50 per person* (to help us cover the cost of the meals and the camp ground group site). Visit our Donation page here. All activities during the weekend are free. Weekend registration is required through the registration form below. *Please note that the suggested donation is cheaper than what it would cost to reserve a camp site and pay for food for a weekend trip on one’s own, but we may have some limited sponsorships available to help cover the costs for participants that may not be able to afford the suggested donation. Please contact info@gcwolfrecovery.org for more information. Save the Lobo in Hon-Dah/Pinetop Aug 11 and Truth or Consequences Aug 13! 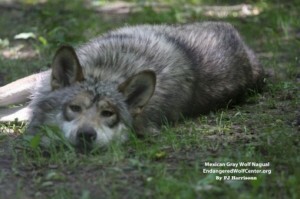 Sixteen years after they were reintroduced, only 83 Mexican gray wolves remain in the wild. The wild lobos have undergone dangerous genetic deterioration due to government and private shooting and trapping, along with a freeze on releases of new wolves from captivity. The U.S. Fish and Wildlife Service (FWS) has proposed changes to Mexican wolf management —two good changes and many more that will worsen the lobo’s already-tenuous plight. The FWS will hold public hearings on its proposal on Monday, August 11 at Hon-dah, near Pinetop, Arizona and on Wednesday, August 13 in Truth or Consequences, New Mexico. They must listen to all those speaking up for and against the lobo. The Koch brothers, secretive anti-conservation and anti-labor billionaires, have teamed up with anti-wolf special interests to influence the government and doom the Mexican wolf. You and other supporters of the Mexican wolf are all that will stand between extinction and survival for these critically endangered, beautiful, intelligent animals. Please speak up for the lobo at a hearing in August. Carpools will be organized for both locations. Use the link at the bottom to register for carpooling. The annual Big Lake Howliday Campout has been rescheduled for August 8-11 so that lobo supporters can go from there to the hearing at Hon-Dah. Go to www.gcwolfrecovery.org for more info. We will have activities and refreshments for wolf supporters at both locations starting by 2 p.m. – check back at www.mexicanwolves.org for updates as the date gets closer! The public hearings will be held from 6-9 p.m.
A critical mass of supporters at these hearings can turn the tide for the Mexican gray wolf. Please save the date and spread the word! This event will capitalize upon the screening of the movie Wrenched to further discussions on Edward Abbey’s impact and legacy on Southwestern public lands conservation to create public awareness and foster action relative to several pressing and timely conservation issues facing the White Mountains region of Arizona. Suggested Donation is $50 per person* (to help us cover the cost of the meals and the camp ground group site). Register for the event here. All activities during the weekend are free. Weekend registration is required through the registration form (see registration form below). *Please note that the suggested donation is cheaper than what it would cost to reserve a camp site and pay for food for a weekend trip on one’s own, but we may have some limited sponsorships available to help cover the costs for participants that may not be able to afford the suggested donation. Please contact info@gcwolfrecovery.org for more information. Please contact Emily at info@gcwolfrecovery.org or (928) 202-1325 if you have any questions.